Considering Baby S will be 5 months old by the time I post this it's safe to say I am running a little late with this update. When I wrote her 3 month update I missed a good bit out, unintentionally. As a result I have decided to try a new, more organised way of recording how Baby S is developing and what milestones she is hitting. I've been using post it notes to remind me of little things that have happened! 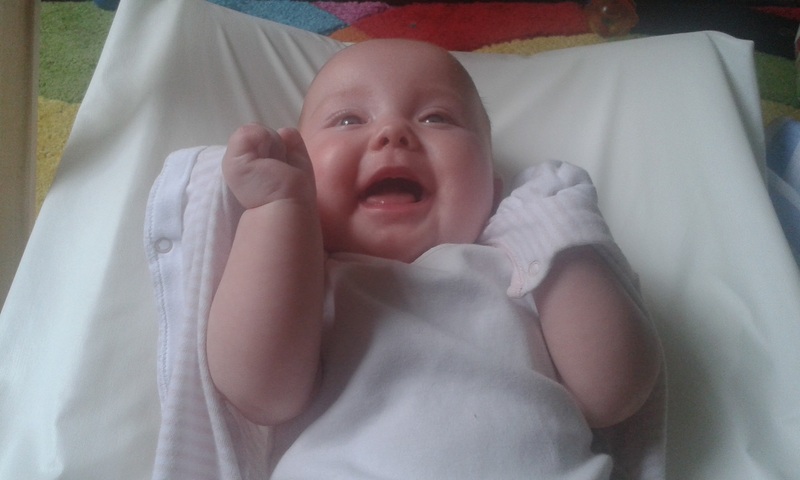 As I mentioned in her 3 month update Baby S has certainly got her own opinion and is learning just how she can express that opinion to get what she wants! She is such an independent little lady. Well as much as she can be at 4 months old! She still isn't so keen on crying and will only resort to crying if she really must or has just woken up. She prefers to shout instead. Over this past month she has really started to smile much more. The same goes for giggling. She has been giggling at everything this month including talking teddies, D being silly, funny faces and peek-a-boo. 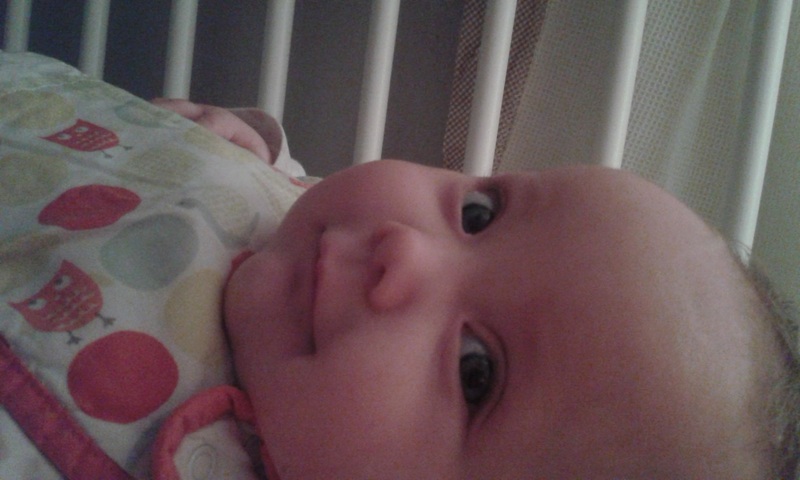 We have discovered her tickles this month two which invokes cute giggles and squirming to try getting away. 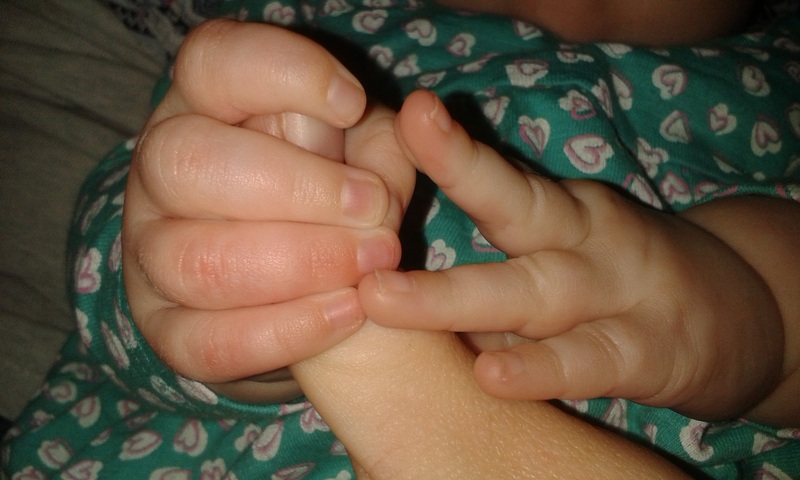 Baby S loves to hold on to you and show you affection through cuddles, finger holding and trying to eat your nose. I'm convinced she's trying to give kisses as I kiss her little chubby cheeks a million times a day which always makes her smile and giggle. In Baby S's 3 month update I mentioned how well she slept and was taking at least 2 naps every day. I don't think I had even hit publish on that update for more than a few days before Baby S decided that we don't do naps anymore! Although naps went completely out the window during the day she seemed quite content, for the most part. After a week or so Baby S got grumpy around the times she would usually have been napping. That was hard. I hate when she is upset! At the same time her bedtime routine was shot (Not that we had a great one to begin with) and getting her to sleep could take hours and hours of feeding and cuddles. Mummy perks right there! Last month she was starting to sit up in her little seat, she had tendancy to lean on one side most of the time and really depended on the support but she loved it! 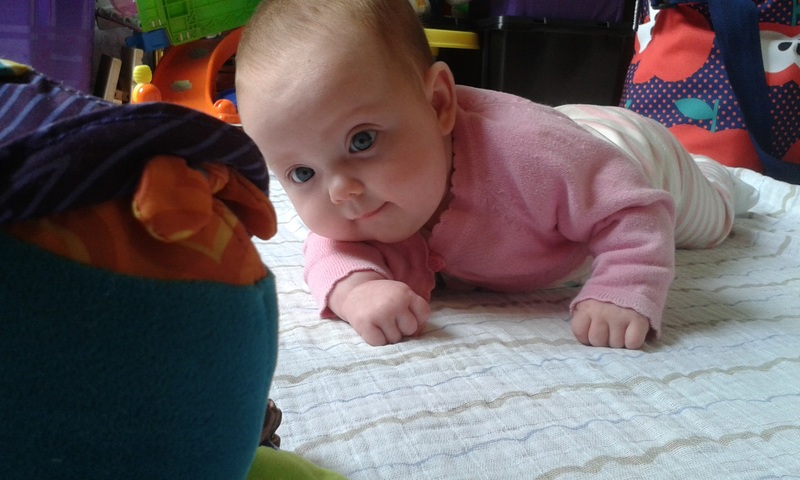 Now Baby S seems to be starting to sit much straighter and using her balance a little more. She is still only able to stay sitting up alone for 3-4 seconds at the minute. She isn't a fan of the falling over onto the cushions part of practicing sitting up. Her grip is getting better and better, this last month she has started to get her hand in a better position to lift and grip items. Although her movements are slightly slower she is improving well. She now opens her hand for a few seconds before tightly gripping onto the item. 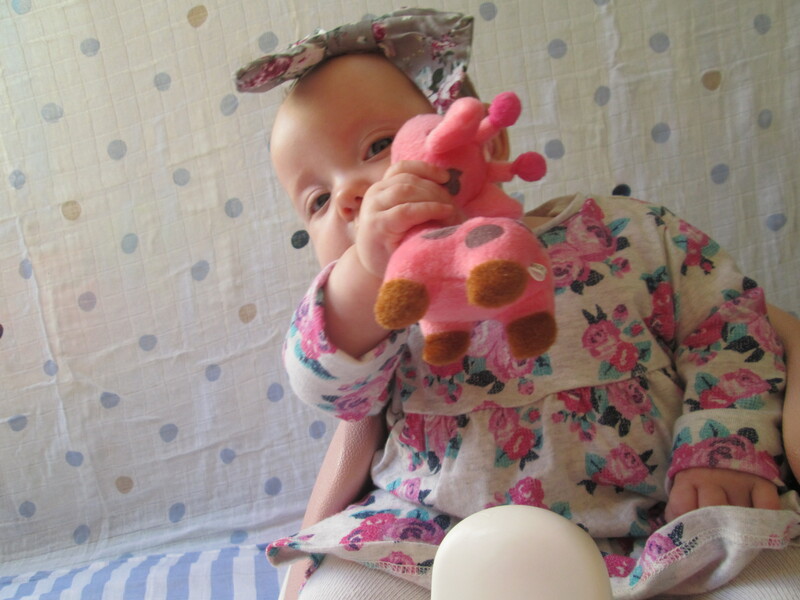 Baby S has started to bring the items towards her face in an attempt to get it to her mouth or to feel the texture. Her aim isn't perfect but she can get it up to her face and push her hand away when she wants to let go. She's very recently learn that if the item doesn't drop she can shake her hand and it will fall. Clever girl! Baby S is certainly not a fan of bibs! We have a few which have a small amount of Velcro and big pulling (quite hard) you can remove them. Baby S has figured out which bibs come off this way. We are lucky if they last a minute! 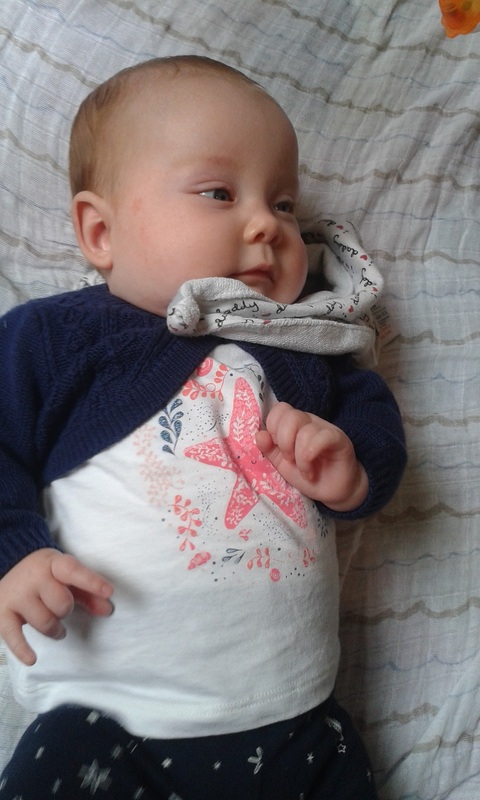 Although I tend to forget that Baby S came rather early and was considered a premature baby (She was born at 36 weeks + 3 days) it does mean that her developmental markers are a bit out of wack and she hits them at different times from other babies her age. She's not far behind but now it is becoming a little more apparent that she should be that little younger. Over the last month Baby S has really started to actively show an interest in her toys on her toy bar while having playtime on her mat. She loves trying to touch them and making them move. There are a few small toys which interest her outside those on her toy bar, she loves the few which make a jingly tune. She also enjoys babbling away to them! Most recently she is showing an interest in toys which light up as well as making sounds. She gets so excited when she about them. Her babbling has started to advance further and she tries new sounds and shapes with her mouth. Some are a work in progress but she mostly gets a sound to come out instead of just mouth movements now. She certainly loves to talk so far! A big milestone I forgot to mention in last months update is that Baby S can roll over from her tummy to her back! She thinks it's funny and giggles just after she's done it. Each time she does roll over she moves herself into different positions to do it. So far she's taken no interest in trying to turn back over to her tummy but she shouts to let us know she wants to go back on her tummy. This last month Baby S has started teething. She seems to be cross teething with some of her back teeth coming through. There is one in particular on her bottom right side which seems to be causing her a lot of discomfort. I don't think she will be waiting too long for it to break through. You can already see the whole tooth shape under her gum if she is screaming (usually when I put her in her pram!). She really enjoys biting down on anything firm she can get her hands on, daddies skinny fingers are her favourite. So far we have been very fortunate and Baby S has managed to avoid all the bugs going around, considering D has had one or two so far she's doing well. I'd like to think breast feeding is giving her the extra anti bodies she needs to keep most of the bugs at bay! I haven't got her weighed this month but I did measure her (myself and she is now measuring up at 66 - 67 cm. She's fitting perfectly into her 3-6 month clothing now. I must admit I am a little worried she will out grow them before too long. We are still exclusively breast feeding. 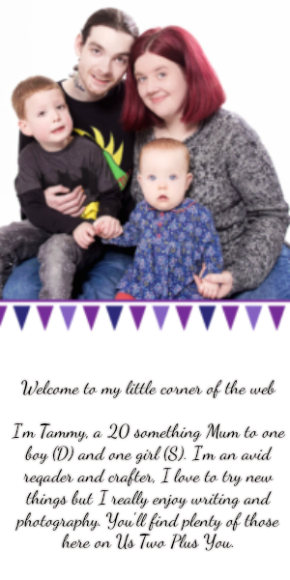 This month I have been breastfeeding Baby S for longer than D and I had managed to! Breast feeding is going well. She is still feeding around 10 times a day and will have 2 - 3 night feeds. Although she's not sleeping through she is only waking up for a feed and a quick change before drifting back to sleep.